We ripped up the yucky carpet, we had and my husband is laying hardwood floor. It takes him awhile - we are not in a huge rush, but I do wish to have it done by Thanksgiving. Old carpet can smell. This house belonged to my Mom and Dad. Mom was a very good housekeeper, but that final year, she lived after my dad passed away, she didn't care. She had 2 little Yorkies - one of them, just wouldn't do her duty outside. Before we moved in, I would take baking soda and spill it on the carpet, before we left to go back home, to the bay area. The next weekend, when we came up, it didn't smell. Baking soda is awesome. When we finally moved in, I steam cleaned the carpet and it was fine. I still had the icks...but that is just me. Mom had fibromiaglia and dad put a very light beige, berber carpet in the kitchen and dining room. Sorry, but carpeting in the kitchen is like carpeting in a bathroom. Just gross. The first night, we moved in, I made spaghetti. You can guess, what happened. I had to use a throw rug to hide the stain. 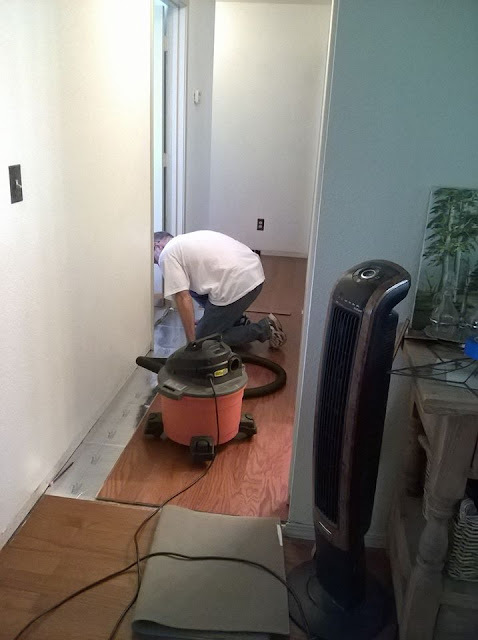 After about a month, we ripped out the carpet, which was glued on the cement foundation, and put in a hardwood floor. (Not laminate.) We should of done the hallway, and for whatever reason, we didn't. So, 8 1/2 years later, we are finally, laying down hardwood. My husband matched it with the other, well.